Is There a Wrong Way to Blog? It’s been a whirlwind week that started in California and ends here in Raleigh with Easter weekend. I am in a pretty fast-paced season and it’s starting to catch up with me. There are so many great things happening that keep us busy, it’s hard to complain. But I am still human and sleep is nice once in a while. My prayer for the weekend is that I could mentally detach from the constant ticker-tape-to-do-list that is running behind my eyelids at all times. I want to enjoy my family, focus on our faith and celebrate a life of love, forgiveness, and grace. My prayer is that you would be able to do the same. It’s easy to say that grace is for you. But it is also for me. Grace is for me. It’s good to say that out loud once in a while. Or on the hour if you need it. 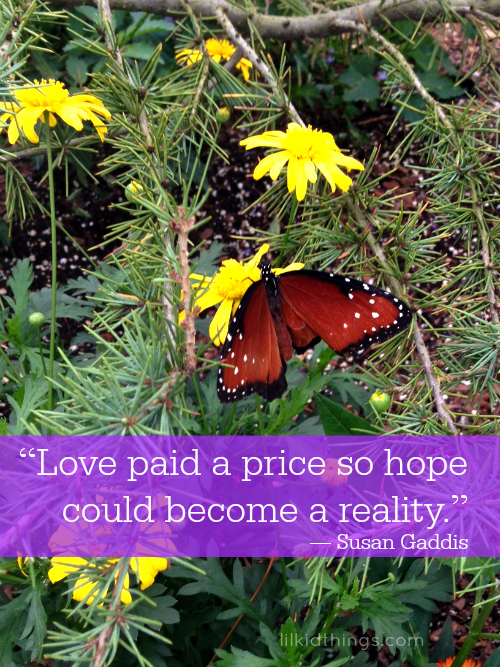 I love the above quote from Susan Gaddis. It’s so very true. Grace is real. Hope is real. And it is for you and for me! Wishing you and your families a very Happy Easter! Easy Caterpillar craft from leftover Easter eggs! Raleigh Easter was a Success! How bout a real update….